I have bought something really amazing for my literary James Bond collection. When Ian Fleming decided to start writing about SPECTRE and the villain Ernst Stavro Blofeld he did not invent the characters name. Just like the name for James Bond. He simply stole it. Thomas Robert Calthorpe Blofeld was born on in 1903 and was at Eton at the same time as Ian Fleming. 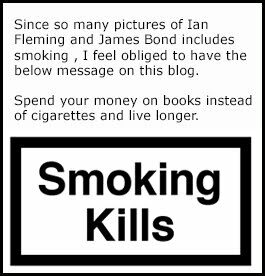 According to the legend, Thomas was not a friendly person and Ian Fleming disliked him a lot. Later in life when Fleming was working on his upcoming movie script that later turned in to his next novel Thunderball he decided to use the name for his school enemy as James Bond's enemy and head of SPECTRE. So the name went from Thomas Blofeld to Ernest Stavro Blofeld. Thomas Blofeld is also relative to the British cricket commentator Henry Blofeld who was born in 1939. He is 77 years old today. But both Thomas and Henry Blofeld were both book collectors and in silence they did indeed own copies of the James Bond books where there name was mentioned. But a few weeks back, these books were up fore sale and I managed to buy them for my collection. So what is so special about these books? Well these books carry the armorial bookplate of the Blofeld family. In other words as a glued inlay the books carry the coat of arms of the real Blofeld family. And it do differ from the one that Fleming gave his Blofeld. The Blofeld villain was included in the novels Thunderball, On her majesty's secret service and You only live twice. I own all three of these from the Blofeld family with their very own coat of arms within the books. 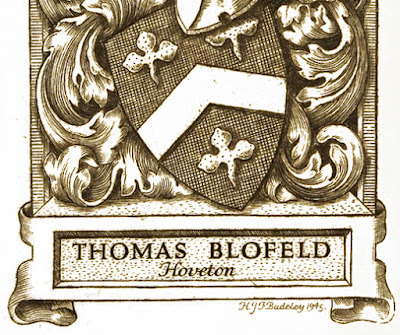 The fine armorial bookplate of Thomas Blofeld was designed by Sir Henry John Fanshawe Badeley (1874-1951), who was responsible for the design of many bookplates for the Royal Family and members of the Peerage. This, I believe, must be the rarest books in my collection. The Thunderball and On her mejesty's secret service Jonathan Cape are first editions but sadly the You only live twice is the second edition that says March 1964. All three books are signed by Henry Blofeld. Below is a picture of the bottom half of their Coat of Arms. I will not share the upper half or the signature in case any forger's will read this post. Off course I also have a receipt saying that these books come from the Henry Blofeld collection. Here you can listen to a very strange sound clip of Henry Blofeld talking about James Bond.